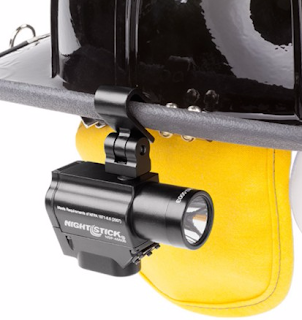 The new NightStick Helmet-Mounted Flashlight is an awesome option for hands-free lighting with a multi-function design--it easily outshines the competition. This light is built tough from ADC12 aluminum alloy, able to withstand the harsh environments of the scene. Unlike other helmet-mounted lights, NightStick's light has a user-selectable brightness floodlight, with a soft, unfocused light pattern perfect for safely accomplishing several tasks: reading respirator gauges, inspecting, etc. The dual-light technology means the user can select from high, medium and low-brightness, or can use the floodlight setting on high, medium-brightness and survival-mode, and both for dual-light. The powerful, front-facing 220-lumen beam stretches for 183 meters (600 feet), while the bottom-facing floodlight offers 50 or 100 lumens of light. CREE-LED technology, giving you 50,000+ hours of light. Compatibility with all helmet types and hard hats. Easily mountable to brim or side of most helmets. Waterproof, impact, and chemical resistant. 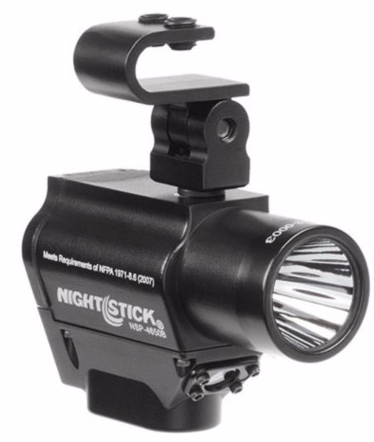 To learn more about the new NightStick Helmet Mounted Multi-Function Dual-Light Flashlight, visit our website.